If you are having a hard time dealing with a profusion of emails in your clients, there is an effective solution to your problem. You can use Total Mail Converter and archive your messages in TXT, DOC, RTF, PDF, HTML, and TIFF. This tool converts emails from any client. With the help of Total Mail Converter, you can convert MSG to TXT in batch in less than no time. This email converter is easy to work with for even a beginner. The interface is laid out in such a way that you can foresee your every next action. 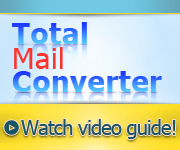 Total Mail Converter requires minimum work on your side. All you need to do is make options. The program features a friendly Wizard that guides you through the procedure and helps you make your settings. To convert emails to TXT, run the utility and select the folder with your mails. Then check the messages you wish to convert. If you would like to render all the messages in TXT, press Check All. All the files will be marked automatically. Select TXT. The Wizard's window will open. Here you can choose the destination folder and fields you wish to export: Sender, Recipient, Date, Body or Subject. Also, you have a lot of options to handle your attached files, which you can extract and placed into any folder you choose. If you are through with your options, click Start to complete conversion. This MSG Converter features command line support. This function permits you to launch the program from within any other application. Besides, it integrates into the right-click popup menu. You can convert your emails right from the desktop. Right-click on a file and click Convert to. The interface will be launched. Then follow the procedure described above. This mail converter is available for download. You can order it right now and get the activation code. If you are not sure yet, download the free demo version and use it for 30 days. Please, don�t just take descriptions on trust. Try it right now! Registered users are entitled to free tech support and regular upgrades.